We live in the heart of beautiful wooded Hampshire. 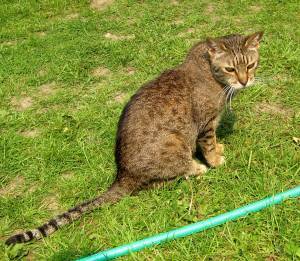 The big back garden is cat proofed and all the cats have access to it in safety. 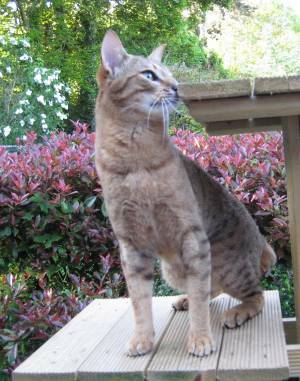 It is cat orientated so there are trees to climb, shrubs and bushes to play around and under, and long stretches to tear about in. 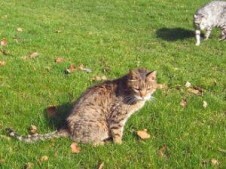 The boys houses are here and they too get a daily chance to explore, stretch their legs, and mark their territory, following on the boy who has carefully marked before them. We have a large family, the bigger proportion of which are neuters, who stay on after their breeding days are over. We peaked at 35 members a few years ago, but sadly numbers have dropped a bit since then. 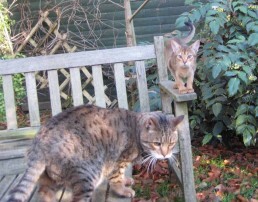 Here are the oldest and the youngest, in a bit of November sunshine! 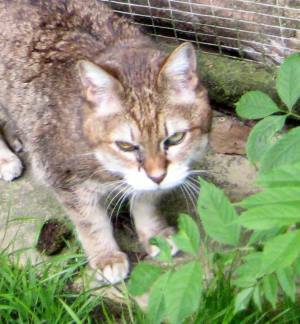 Bengal Catoninetail Umkulu (Kulu, the big one) turned 20 in February , 2011, and little Abyssinian Thickthorn Manuka was just six months old. 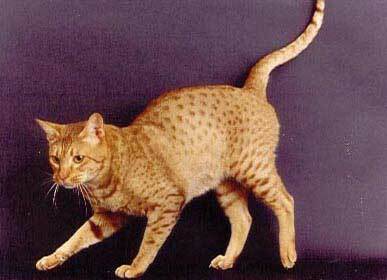 Many of the Neuters have made names for themselves as the Ocicat proceeded through Preliminary Status, through Provisional status, and finally to Championship Status in the UK. Catoninetail Kanaka of Thickthorn , now 17 years old, but a CFA Grand Champion at 15 months before I was allowed to have him over here. Kanaka is a cinnamon, and still shows his quality, especially that lovely square muzzle. He sleeps a bit more these days, but still enjoys life to the full. 29th July 2008 Dear Kanaka died in his sleep early this morning. 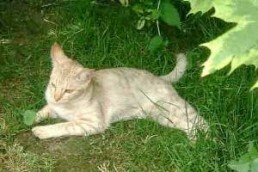 Buttercup was neutered this year. From her litter last year I kept Folly (Thickthorn Cafe au Lait) and Buttercup can now enjoy life without the nuisance of incessant calling. Rowan and his spotted siblings were born after the loss of their father, in late August 2006. 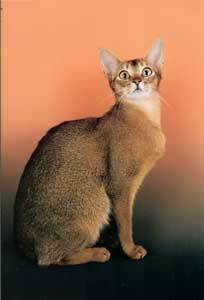 They are F2 Ocicats, and their mother is Thickthorn Treacle. All are clear from Pyruvate Kinase Deficiency. 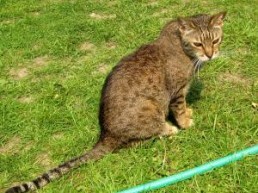 Rowan is neutered and now lives happily with his mother Treacle in deepest Oxfordshire. 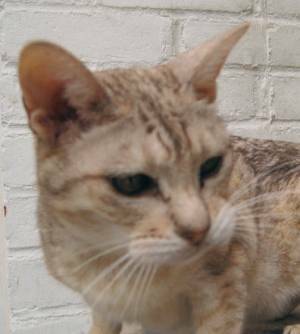 Having helped to establish a new Ocicat line, and still giving great pleasure with her beauty and loving temperament is Ch. Chereves Wild Honey of Thickthorn. 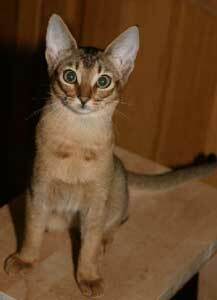 Honey is a Usual (Ruddy) Abyssinian. and an American import. 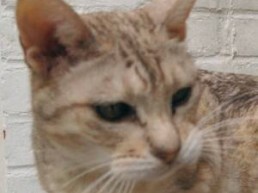 HONEY is a GCCF Champion and also a TICA Champion (2010). 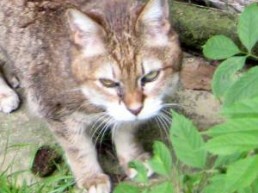 Thickthorn Treacle is Abyssinian Honey’s tawny daughter, the second step in that new line. 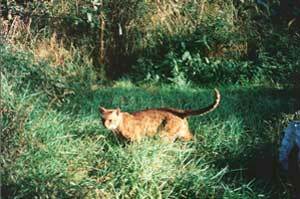 Treacle’s father is another tawny, Thickthorn Thunderbolt. 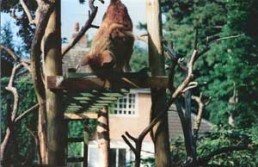 Treacle and Berry had an F2 litter in 2006 with four spotted tawny kittens. 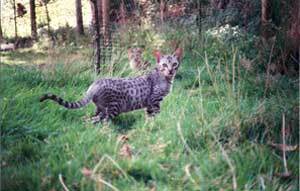 These are very special kittens, as they were Berry’s last litter and also the culmination of the breeding programme to establish a new line. 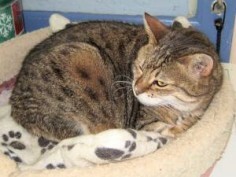 Treacle now lives with her son THICKTHORN BERRY’S LEGACY (Rowan) with David and Ann in a lovely country home. Living with Bengal Umkulu still is his little wife Ingwe (The Leopard) also 20 and in good health and spirits is their daughter Ikati (16).